Thai Basil Stir Fry - He's Been Making It Here for 47 Years in Bangkok! Thai basil stir fry (ผัดกะเพรา pad kaprao) is one of the pillars of Thai street food comfort in Bangkok. It’s one of those dishes that’s simple to make, complex in flavor, it never gets old, and it’s without fail, always satisfying – especially over rice with a greasy fried egg on top. 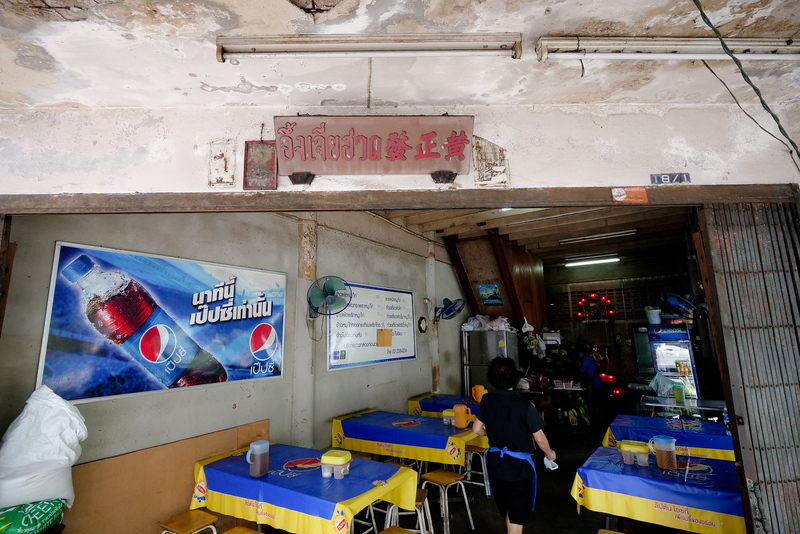 In this post, I’m going to tell you about a little corner restaurant in Bangkok where you can get a delicious plate of it. 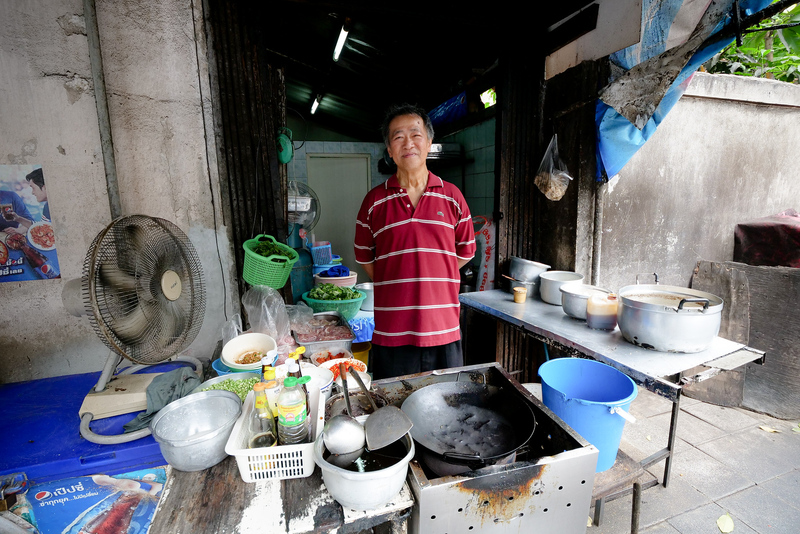 On a corner side street, just barely a stones throw from the bustling Asoke intersection, is an Uncle who has been making Thai basil stir fry (ผัดกะเพรา pad kaprao) for over 47 years. 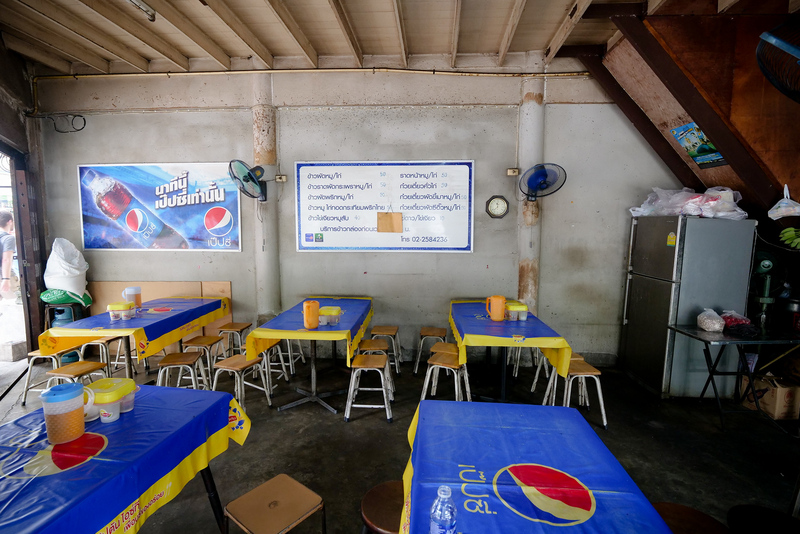 It’s in a spot where you can easily walk past, just down the road from the infamous Soi Cowboy, and surrounding by luxurious international restaurants. He makes a variety of different quick stir fry dishes, but among his specialties is Thai basil stir fry with your choice of either pork or chicken, and either minced meat or sliced meat. Uncle cooks with such expertise, he’s the type of experienced cook that could make Thai food with his eyes closed. You know from the beginning it’s going to be tasty, just from watching him work the wok and handle the ingredients. It’s important to note, to make Thai basil stir fry, it must make use of holy basil (or tulsi), which is much different from Thai sweet basil (which is commonly referred to just as Thai basil). Thai holy basil has a beautiful peppery taste and is very aromatic. 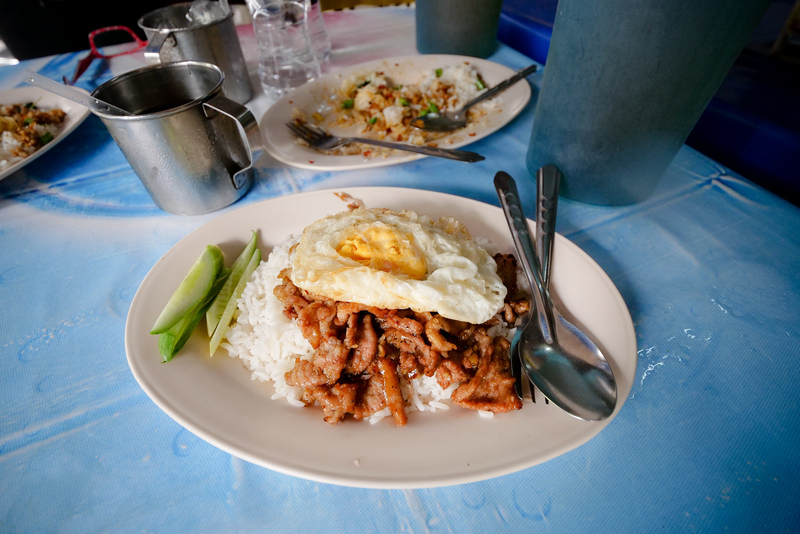 I began this meal with a plate of minced pork Thai holy basil stir fry, all over rice, with a fried egg on top. 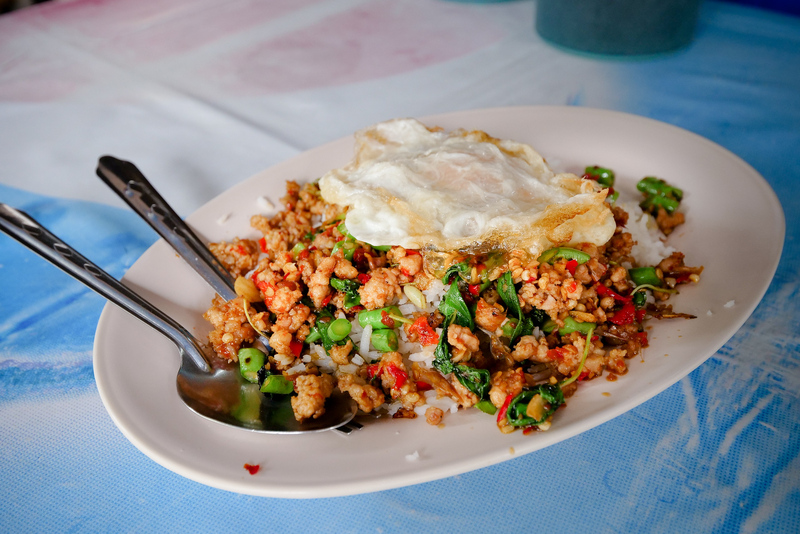 The rice, the basil stir fry minced pork, and the runny fried egg, all combine to create what is easily one of the greatest Thai street food dishes of all. One of the touches that Uncle does when he stir fries the meat is he first adds some oil to the wok (possibly lard), fries the meat for a few seconds, then drains the oil. This gives your minced meat crunchy edges. 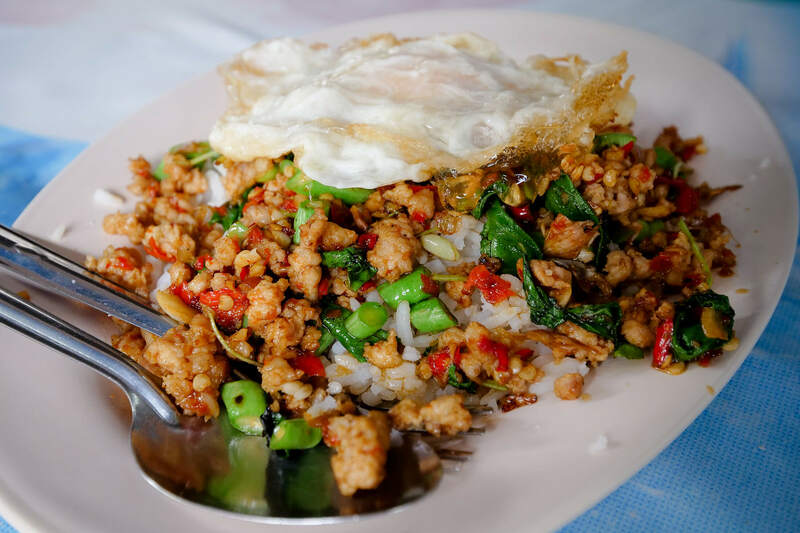 It’s impossible to say any pad kaprao (ผัดกะเพรา) is the best in Bangkok, but Uncle’s version is just perfect for what it is – it’s what you want it to be in the moment you’re eating it. 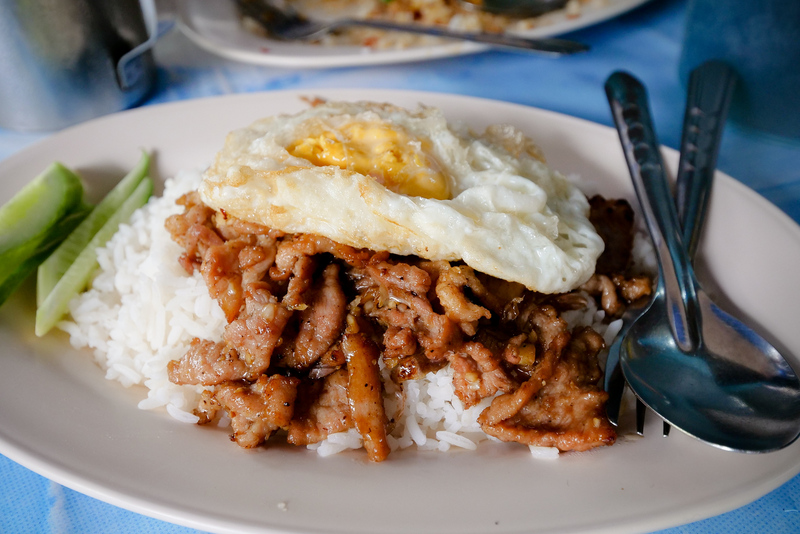 Fried pork garlic (ข้าวหมูทอดกระเทียม) – Also a must order! Another dish I ordered was fried pork garlic (ข้าวหมูทอดกระเทียม khao moo tod gratiam), another classic Thai single dish, one plate meal deal. Again, just like the Thai basil stir fry, this was simple and satisfying with every single bite. The pork was again fried in a bath of oil, drained, and then stir fried with the seasonings like dark soy sauce, garlic, and black pepper. Perfectly salty, on the oily side, but so tasty, and with a nice touch of black pepper. Again, the egg is not mandatory… ok actually I take that back… the fried egg is mandatory. There’s nothing better than yolk to coat. For me, dining atmosphere in Bangkok can hardly get better. It’s nothing fancy, just a corner building, a few tables and stools, both inside and outside, with a concrete finish. 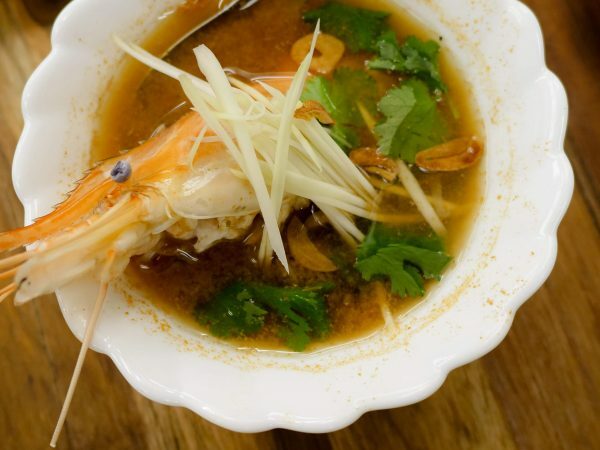 The menu is written in Thai – he does offer a few other single plate dishes like Thai fried rice and radna. Prices: Each plate is about 50 THB, a little higher than normal, but it’s a very high end area, and it’s totally worth it. Mark, Google Maps says this location is permanently closed. Is it true??? Mark, I am trying to go here, but I looked at the google map and it said closed permanently? is this true? do you know what happened? Well I learned something new today! I didn’t know Holy Basil is different from Thai Basil. Good to know. I just ordered some Holy Basil seeds because of this. I’m very excited to grow them. I want you to know that your videos are so entertaining and informative. I see a lot of YouTube segments that are drab and so poorly produced, but not yours. You engage with the camera very naturally. And every single time you take a bite, your head begins to nod “yes” to the affirm the deliciousness of the food! lol I love that! This recipe for Thai Basil Stir Fry gave me some new ideas, as do all your recipes! Thank you! Hi Mark, just visited the place today. Uncle really knows his food well. Minced pork basil stir fry was really delicious. But I was not happy with serving of the meat as it was very less so I ended up ordering another plate. :) thank you for sharing. Was able to go here a couple of months ago and I can testify that their food is great! As what I’ve remember my friends even had 3 orders of fried pork galic because it was really tasty. Will definitely go back here this weekend. Superb. I’ll be back in Bangkok in October and this is a great looking place to visit for my favourite quick meal. In my next visit I will definitely visit this place, very near to the place where I used to stay. This site has been very helpful for me.